As cities go, Menomonie may be relatively small, but it boasts an annual calendar filled with big events for residents and visitors alike. From catching flicks by the lake in the summer to competitive ice fishing in the winter, many of these events connect participants to the natural beauty of western Wisconsin. Dive into the list below for a dozen ideas for year-round fun! Thursdays, Aug. 23-30, 8:30pm • Thursdays, Sept. 6-13, 8pm • Menomonie Public Library 600 Wolske Bay Road, Menomonie • menomonielibrary.org • Following hot on the heels of the Music Over Menomin series, which wrapped up in early August, Movies Over Menomin kicks off Thursday, Aug. 23. Every Thursday night through Sept. 13 a free movie will be screened on the front lawn of the Menomonie Public Library (600 Wolske Bay Road). This season’s lineup includes classics like The Princess Bride, Dirty Dancing, Back to the Future, and The Karate Kid. Saturday Oct. 13, 4-8pm • Tanglewood Greens, 2200 Crestwood Drive, Menomonie • tinyurl.com/StoutOktoberfest • On Oct. 13, Oktoberfest will come to Menomonie with a craft brew spin. The Midwest Craft Brewers Oktoberfest runs from 4-8pm at Tanglewood Greens and offers tastings of local and regional craft brews. For the price of the $30 advance ticket ($40 at the gate) attendees can attend the festival, pick up a souvenir glass, enjoy some tasty craft beers, dance to live polka, and be transported with a genuine Oktoberfest celebration. Prizes will be doled out for those in the best traditional German attire. While this event isn’t exactly for the kids, children younger than 16 can come along for free to listen to the music and dance. 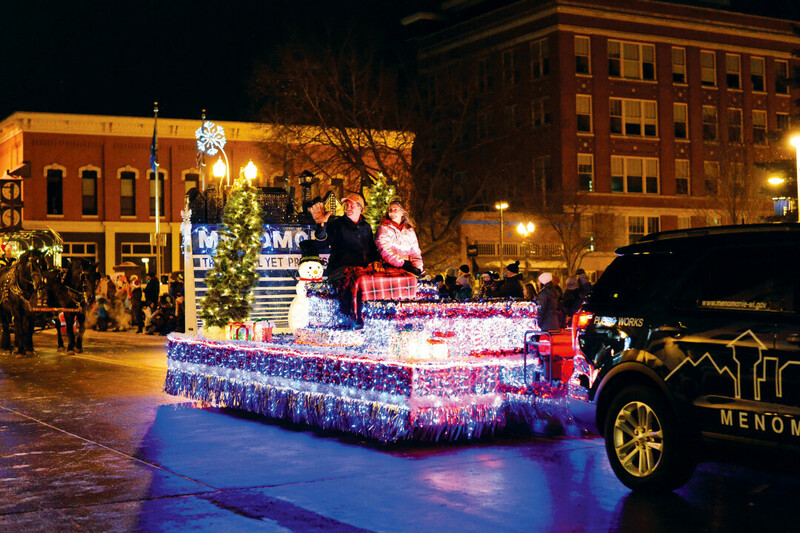 Thursday, Dec. 13, 4-8pm (parade at 6:30pm) • downtown Menomonie • downtownmenomonie.com • In mid-December, Menomonie’s main streets are alive with twinkling lights and snowflake decorations while the Winterdaze Parade passes through. The evening offers a chance to meet Santa and Mrs. Claus, take a horse-drawn wagon rides, and sip free hot cocoa. The kids will love the holiday atmosphere and revel in the chance to ask Santa in person for that gift they’ve been fixated on. Ending with a fireworks show over Lake Menomin, this event is the perfect kick-off for the holiday season. Friday-Sunday, March 1-3 2019 • Lake Menomin, Menomonie • naifc.com • Think you’ve got what it takes to catch fish in the depths of an icy Wisconsin winter? Then grab a fishing buddy and make plans for the North American Fishing Circuit’s annual tournament on the frozen surface of Lake Menomin. Next year’s event is slated for March 1-3. In addition to the competition itself – anglers will race to catch eight sunfish and eight crappies – there are fishing seminars, a kids camp, and a Sunday weigh-in that will determine which local competitors will make their way to the NAIFC National Championship. Saturday, May 11, 2019 • getitdunnrun.com • Each May the streets of Menomonie fill with hopeful runners ready to Get It Dunn. The 5K and half-marathon races raise money for Mind Over Matter (M.O.M. ), a local agency that provides tens of thousands of dollars worth of scholarships and camperships for local kids. The race is chip timed and provides live on-site results upon finish. Prizes are given to the top finishers, but everyone who runs gets a T-shirt. Those who finish the half-marathon also will receive a finisher medal. And be sure to stick around for a post-race celebration featuring food and live music. Late-May 2019 • dunncountyhumanesociety.org • Keep those running (or at least walking) shoes handy, because Menomonie hosts another run each year in late May, the Dunn County Humane Society’s Mutt Strut N’ Tabby Trot. The event includes a 5K fun run and 1K and 5K walking options. The proceeds from the event go directly to support the Dunn County Humane Society in their efforts to provide forever homes to our furry, fluffy, hairy, and feathery friends as well as community outreach and educational programs. The event usually includes a bounce house, pet expo, kid’s games, silent auction, raffle, and concessions. Thursdays 7pm, June-early August 2019 • Menomonie Public Library 600 Wolske Bay Road, Menomonie • menomonielibrary.org • On every Thursday night from June through early August live music fills the air over Lake Menomin. Local bands perform original and cover songs for nine consecutive weeks for the public to enjoy. The music begins at 7pm each Thursday on the lawn of the Menomonie Public Library (600 Wolske Bay Road). You’ll hear jazz, blues, rock, and more – all for free! 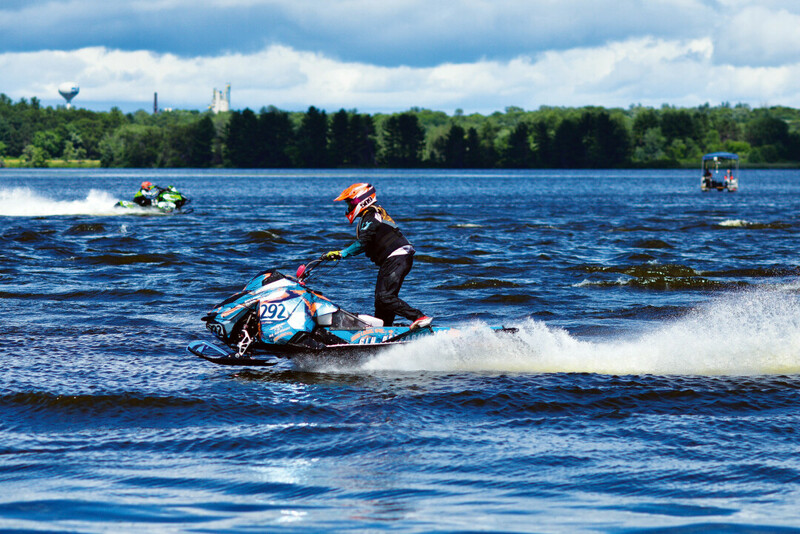 Late June or early July 2019 • Lake Menomin, Menomonie • lakemenominwaterx.com • Each summer in late June, Lake Menomin is home to an extreme sport like none other. Hosted by the Menomonie Lions Club as an annual fundraiser, the Lake Menomin WaterX combines hometown charm with watercross – a sport in which racers hydroplane sled-outfitted snowmobiles across open water. This family fun event is awash in racing action as well as food and beverage vendors and live music on the beach. July 4, 2019 • Wakanda Park, Menomonie • menomoniechamber.org/pages/freedomfest • Celebrate Independence Day at FreedomFest, Menomonie’s largest community event. Festival-goers gather in Wakanda Park to mark July 4 with helicopter rides, bounce houses, clowns, eating contests, a beer garden, live music, and a massive fireworks display. Food vendors can feed any and all appetites while the family fun ensues. Admission is $5 a person, but kiddos 10 and under – as well as veterans and active-duty military members – get in free. Wednesday-Sunday, July 24-28, 2019 • Dunn County Fairgrounds 620 17th St., Menomonie • dunncountyfair.org • The Dunn County Fair will be back next July to celebrate the best of the best in Dunn County. Livestock judging panels, homebrew competitions, and the crowning of the Fairest of the Fair are not all that the Dunn County Fair has to offer. Food and beverage vendors will be scattered around to sate hungry and thirsty fair-goers while music is played at the free stage and motors roar at the grandstand. A carnival will entertain the younger attendees with rides and games. Mid-summer 2019 • Phelan Park, Menomonie • dunnhistory.org/bluecaps • Each summer the Menomonie Blue Caps host a Vintage Base Ball Festival inviting teams from around Wisconsin and Minnesota to compete for diamond glory. But this isn’t any baseball tournament: The Blue Caps and the other competitors wear replica uniforms, use replica equipment, and play by 1860 rules: For example, a fielder can make an out by catching the ball on the first bounce, but players don’t wear gloves! The action will make you yearn for a simpler, more gentlemanly time in sports history. Huzzah! 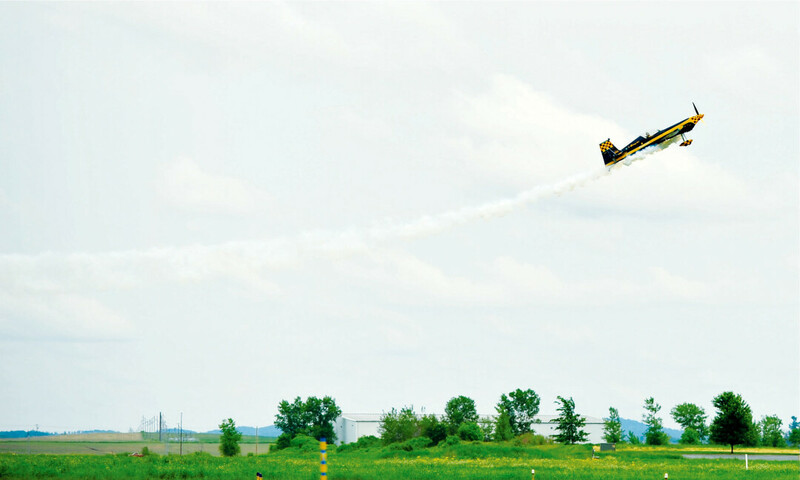 Early August 2019 • Menomonie Municipal Airport • menomonieairfest.com • In early August, the Menomonie Regional Airport hosts the Menomonie Airfest and Autorama. This event boasts aerial acrobatics and helicopter rides in addition to local food and merchandise vendors. And the high-flying show isn’t the only entertainment: An all-day car show and radar run also will astound visitors. This event is a family-friendly affair with a designated kids area that will entertain the entire family. For more Menomonie events all around town, check out our events listings at volumeone.org/menomonie.